After my panel last week with Derek Muller at the North American Carbon Program meeting in DC a few people noted how Derek and his video on climate boredom point to the subject of climate as inherently boring whereas I point to the communicators themselves as doing an inadequate job. Let’s take a closer look at this divide. IS CLIMATE INHERENTLY BORING? 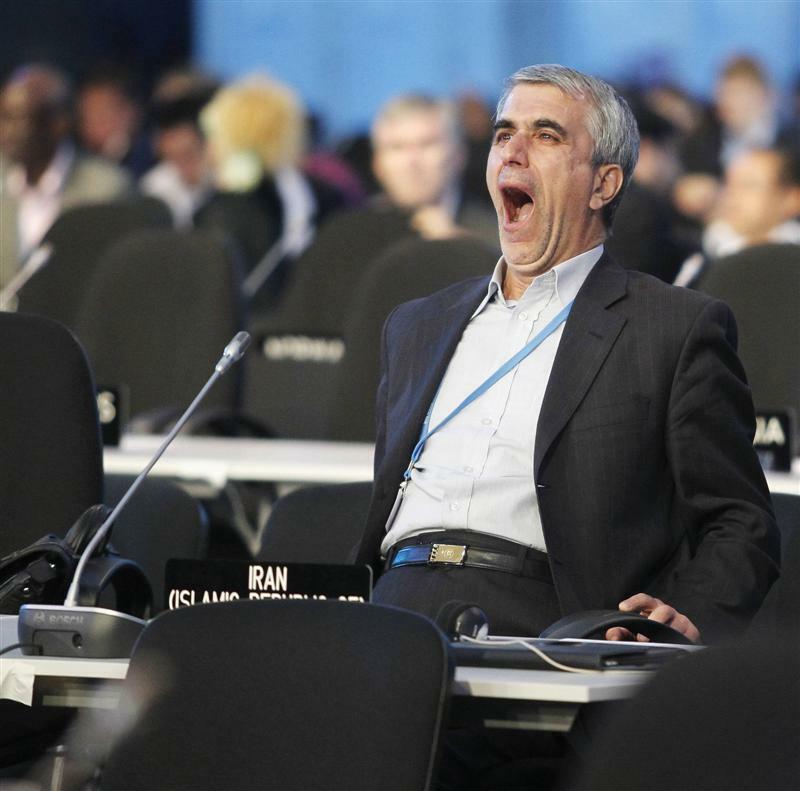 I have a feeling this delegate from Iran to the recent climate change conference in Peru would say so. I love the video, but I don’t agree with his premise that climate is somehow intrinsically boring and thus a hopelessly difficult subject to communicate. I think there’s plenty of reason for hope that some day someone will produce a film about global warming that involves such excellent storytelling that generations will want to watch and rewatch it as much as “The Wizard of Oz.” Here’s how that could happen. I love innovation and creativity. I pretty much live for it. And I know it requires less literal thinking. A great case study of the power of innovation and creativity is what happened with the life story of Mozart in the movies. It’s a good parable for this climate boredom problem. Similar to the subject of climate, for decades in Hollywood the subject of Mozart was seen as too boring to be the focus of an entire movie — there just wasn’t a good story. People figured he was such a genius, there must be a good story. But there wasn’t. There was only the “and, and, and” elements of a good resume: Mozart was a child prodigy AND he was a teen prodigy AND in his twenties he continued to be a genius AND by the time of his death at just 35 he was … still pretty much of a genius. You could make a movie of all that, and the Mozart fans would probably love it as they got to hear their favorite music and coo over how amazing he was. But that’s not great storytelling. That’s a journey from Point A to Point A. And as a result, no one was able to make a memorable movie about Mozart. All the way up until 1984. Finally a brilliant playwright named Peter Shaffer cracked the nut. Instead of telling the one dimensional story of Mozart the genius, he took a less literal, more creative approach to the material. He discovered this other character — Salieri — a man whose life story was indeed an interesting journey. Salieri began life thinking he was a peer to Mozart, but by the end of his life was forced to accept that he was a mere mortal, not made of the same stock as Mozart the genius, and thus ended his life a bitter and jealous man, filled with the sort of human frailties that interest audiences. The play was turned into the movie “Amadeus,” which is #53 on the AFI List of 100 Greatest Movies. It’s one of my all-time favorite movies. And it should be an inspiration to people wanting to communicate about climate in a way that will stick with people many years later. The fact is, it would have been easy in 1980 to say, “Face it, Mozart is boring, you’ll never manage to interest people in him.” But after the movie came out no one would have called Mozart boring. I have said before, science communicators should almost take a sort of Hippocratic Oath swearing that there is no such thing as a boring subject, only inadequate communicators. It’s the truth. Just watch HBO’s Real Sports with Bryant Gumbel. They manage to take the most trivial and unknown of sports events and tell fascinating stories set in those worlds because they have the ability to spot an interesting story when it comes along. Perhaps some day the climate communication people, with all their good intentions, will develop this ability. But for now all they seem capable of is telling endless preachy “and, and, and” pieces that simply make things worse. And make it easy to feel like the subject of climate is inherently boring. Some day someone will crack the climate communication nut as well as Peter Shaffer did for Mozart. And it will be great. And transformative as overnight people suddenly think climate is interesting. I will happen eventually, I’m sure of it. But until then, all I see is a dire shortage of creativity. And if you want to see the consequences of the one dimensional, “and, and, and” approach all you have to do is watch the recent movie, “Unbroken.” The book was tremendous, but what Angelina Jolie did was sad and inept. She made a movie that was exactly the sort of one dimensional “and, and, and” piece that I’m bemoaning here. Her movie ended up being a series of episodes of Louis Zamperini overcoming one challenge after another. No arc, no complexity, no inner journey. Just a resume of accomplishments. “Unbroken” ended up with around 50% on Rotten Tomatoes, but even most of the favorable reviews really weren’t that favorable. Angelina has learned the hard way there is more to storytelling than just listing facts. Telling good stories is hard, but absolutely essential to break out of the core demographic of followers.